The MSX-500Di digital microscope,with its 2 megapixel CCD camera,features an integrated 3.5" LCD monitor and is a stand alone unit for inspection and saving images.The USB connection allows for image previews as well as camera control and file transfers (for mass storage) with a PC.Lens magnification is ∞ to 500X like the INF-500 Series (magnification calculated on a 14" monitor).Illumination for the unit is in the form of 27 LEDs,which are separated into 7 blocks that can be switched as desired.This allows for optimum lighting for the subject. - Screen that instantly displays the current settings. 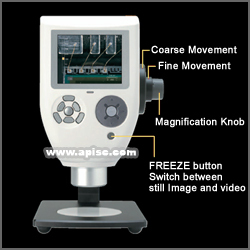 - Digital display of magnification information and auto-scaling. Recorded images can be shown on the display.Each push of the button will display the next new image,while each push of the button will display the next old image. LED Illumination can be turned ON/OFF for each block as desired. Illumination for the unit is in the form of 27 LED lights,which provides the most optimum lighting for each plece of work.Illumination is separated into 7 blocks and can be switched as desired,allowing clear observation of the work. Features a high performance 2.11 megapixel CCD camer.Even the finest of details can be imaged clearly. 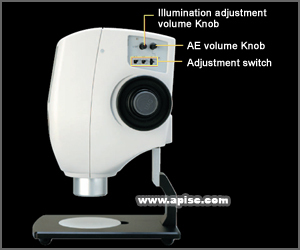 The 3.5" LED monitor is integrated within the unit to allow standalone imaging and saving of images. The camera can be controlled (preview function) via the USB connection as well as for file transfers (mass storage function) (available only with Windows XP SP2). Storage size for each image. The size differs slightly for the image. Microsoft,Windows® is a registered trademark of Microsoft Corporation of Ameraca and other countries.